These two golf impact drills will help you to feel the sensations of a solid impact position. If you’ve seen the impact position checkpoints video you’ll appreciate what a good position at impact consists of – but it’s not always easy to recreate those checkpoints when you’re swinging the club at speed. As you’ll see from the video and summary below, you don’t need an impact bag – you can simply use the bottom of your golf bag out on the range or even as part of a pre-round warm up. 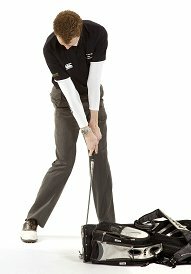 During the winter months, you can try the Static Press drill at home using a door frame to press the club against. 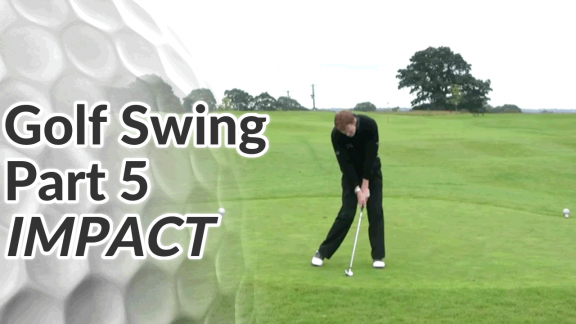 It will help you to maintain that feeling of a solid impact position even when you’re unable to hit ball. 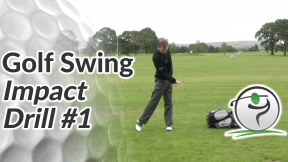 Address the bag as you’d address the ball, in a good set up position. Make a couple of very easy swings, striking the bag using about 25% effort. Gradually work up to a maximum of 75% effort, noticing and feeling the position of your body at impact each time. Feel how your body reacts – your hands should stay forwards, your body weight should drive to the front foot, the hips and shoulders will turn and open up but your head and chest should stay down (see this video for impact position checkpoints). For this drill, you’ll need something solid that will provide a level of resistance. As you can see from the photograph you can just use the base of your golf bag. Set the club at the base of the golf bag in a good address position. Instead of making a backswing, just apply some forward pressure to the club. Try to drive the bag along the ground. While doing so, feel how your body reacts – your hands should stay forwards, your body weight should drive to the front foot, the hips and shoulders will turn and open up but your head and chest should stay down (see this video for impact position checkpoints). Hold each press for 5 seconds and relax. Repeat 5-10 times before hitting some balls (starting with a shorter iron) trying to repeat the same sensations at impact.